Kat soon finds that when you're surrounded by phosphorescence and wonder it's easy to sparkle. Or maybe that's what happens when you fall in love . Or maybe you only shine when you're true to yourself. It's no secret I am a fan of this series. I've enjoyed each book before this one but I think this has to be the favourite of my series so far. I must admit I was a bit worried when I first started it because Kat starts the book very much into her appearance and internet connection and hair straightners. However once the story starts going and she gets to the remote island she is spending the summer on she really changes. I love how funny she is and I love how sweet she is. I loved seeing her grow as a person over the course of the story and seeing how much she changed. 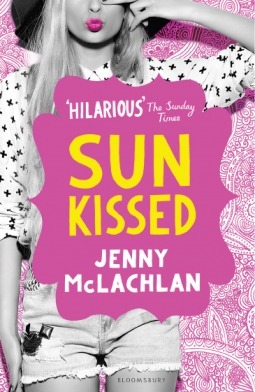 A fabulously funny story which is full of heart and brilliantly entertaining.